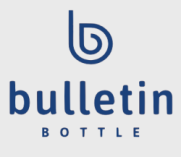 Bulletin Bottle [.com] features a hand-curated assortment of custom stainless steel water bottles in today’s most popular designs. Our stainless steel bottles feature quality construction and a wide variety of colors. Stainless steel water bottles are generally crafted from food-grade stainless steel. Since the metal is non-reactive, stainless steel water bottles don’t leach and don’t have to be lined. However, stainless steel contains nickel, so people with nickel allergies should avoid stainless steel water bottles. Buying stainless steel water bottles in bulk gives your project a high-end finish, but at a lower cost to you since wholesale purchasing means each bottle costs less. Since they’re metal, the contents of stainless steel water bottles can quickly heat up, so make sure they’re not left in a car. We recommend hand-washing custom stainless steel water bottles with warm water and dish soap. A bottle brush can be used to ensure the inside of the water bottle is cleaned. How do I wash stainless steel bottles?